Most of the public art that we have featured this summer has been the type of art that you pass by daily and just need a reminder to look up. Bruce White’s ‘Meander’ is tucked away just enough that you may not have seen it before. 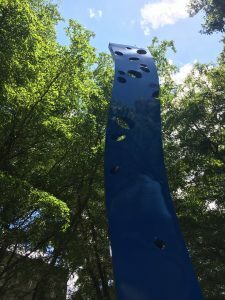 However, once you do notice this 24 foot tall bright blue piece, you will never miss it again! Acquired by the city in 2006, ‘Meander’ stands just off the sidewalk on Orange Ave north of the Federal Building (which is a piece of art in its own right). In a 2012 Herald-Tribune article, Bruce White described this piece as reflecting his love of chaos theory and Swiss cheese. Looking at old pictures of the Federal Building, it is easy to see the difference that a piece of public art makes in a space!